“I always share with others how happy we have been with Dr. Fowler. He has a great way to motivate my kids with their braces, head gear, and retainers. They have seen such great results that they are willing to be compliant with their part of their new smiles. Dr. Fowler always seems so happy to see my kids and has been interested in our lives. He asks about our family and has taken a personal interest in caring for the needs we have had. “The monthly contests are a special treat for the kids when they visit the office. Our favorite one was gathering shoes for the needy. We made an extra trip to the office just for that. “We are always greeted with hospitality by a friendly and professional staff, and never feel like our visit is rushed or crowded. It is a relaxing environment with nice decor and always clean, but we especially love our daughter’s new beautiful smile, thanks to Dr. Fowler’s expertise. 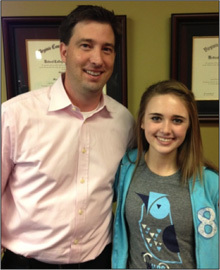 We wanted to let you know that we are so glad we chose you as Madeline and Henry’s orthodontist. We have found that you explain all options and recommendations thoroughly so that we can make informed decisions on all care. Because of that, we feel very comfortable and trust you fully in this process. This definitely puts Henry at ease, too. Also, the staff is always friendly and efficient! It really makes dealing with orthodontics much less stressful for all of us. 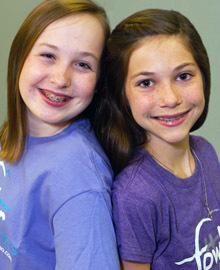 “We have been so pleased with Fowler Orthodontics! Sydney’s teeth look great and she always looks forward to her visits to your office. “I have two children in orthodontic treatment. Their needs are very different, yet one thing is consistent and that is the trust they both share in Dr. Fowler. He always takes time to talk them through what is going on and he is very personable, thus making them at ease. I always wonder how he remembers the personal things and I appreciate that. Thanks to the entire staff who are always warm and friendly.